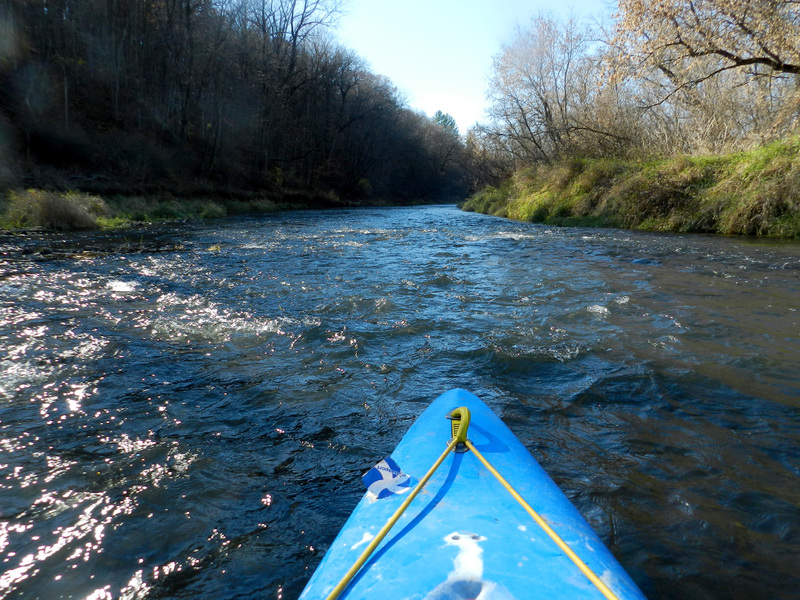 This segment, the crème de la crème of the Platte, is second to none with riffles and small rapids the entire stretch, sweeping bluff vistas and great rock outcroppings in the beautiful Driftless area of Wisconsin. You will not be bored nor disappointed. Time: Put in at 11:20a. Out at 2:20p. Wildlife: Bald eagles, ducks, kingfishers, crows, hawks, sheep, killdeer, horses, bulls, turkey, turtles and a couple coots. I did this same segment around this time last year with a couple friends but it was during the height (which is to say low point) of the 2012 camera debacles and it dawned on me not long ago that I had next to no pictures from that trip. Plus, I had recently paddled the final segment of the Platte, which was a first, so I wanted to do this trip again in order to better compare the two. While the last stretch of the Platte is truly pleasant, this is far and away the better segment. Indeed, of the 23 miles from Ellenboro (the last dam on the Platte) to its confluence at the Mississippi River, this 8.25-mile segment offers all of the highlights and the fewest detractions (e.g., barbed wire, flat water, livestock in the river, etc). You begin immediately with a huge bluff looming ahead and terrific riffles, what better way to start a paddling trip!? Riffles are nearly continuous for the entirety, with only a couple of short exceptions. I would classify a couple of these riffles Class I rapids. They’re just enough water to get the bow all splashy wet (and even inside the cockpit if you’re not paying attention) but not so formidable as to threaten your safety. That said, there are some tight turns, obstacles and strainers to maneuver in occasionally pushy water, especially along the last three miles of the trip, (roughly below the County Road B bridge and the takeout at Big Platte Road) so you do need to be paying attention. For beginners, I would recommend the Big Platte Road to Indian Road section to get a feel first. There are bluffs everywhere and almost no development, at least houses. Farmland and pastures prevail but only occasionally do you hear a tractor in the fields. You will almost certainly come upon some cows or bulls in the water, it’s just about inevitable. There are two sections of large rock outcroppings. The first, about half-mile long and coupled with riffles only a couple miles downstream of the put-in. The second, about a mile upstream from the takeout but in flatwater allowing you to get out and explore the hillside woods and climb the rocks. One even looked like a cave from the water but it was basically a slot through one rock to another, still pretty cool though. There’s one large formation that is table-flat and would make for a good picnic spot or just a place to rest high above the river, overlooking the valley area. Another pleasant feature of this section is the amount of small islands you’ll encounter, each one creating two channels of water to choose, each (usually) with a riffle or more. It breaks up what might otherwise be considered monotonous, plus it provides good practice of reading a river. Not a darn thing. Well, maybe the barbed wire but there’s just one line of it. It is, it should be pointed out, strung across a bend in the river where there’s a considerable set of riffles, so you do need to approach it cautiously or just portage around it. The takeout is totally doable but by no means great or easy. There’s not much room on the road for parking either, though these roads are sparsely traveled. I will for sure. In fact, I think this segment has the makings of an annual spring run trip, when the water will be high(er), in order to experience the Platte with maybe more rapids than riffles. Put-in on Platte Road. It’s a little steep but not too bad. Riffles begin immediately and continue almost non-stop. Just about a picture-perfect horizon line. Handsome red metal bridge on Platte Road. Beginning section of best rock outcroppings, upstream of County Road B bridge. Same stretch with riffles and boulder. Same still; this section is about half a mile long. One of a couple during this trip. First time I think I’ve seen river sheep. One of countless clear water riffles round a bend. The one string of barbed wire in this section. As you can see, it’s placed right at some pushy riffles. The wire can be portaged. Did I mention how riffly this trip is? One of many sections on this trip that in higher water would make excellent Class I-II rapids. A classic strainer. Another hazard that makes this trip unsuitable for beginners. Bluffs are everywhere on the Platte. Picturesque place to stop and picnic. Second section of rock outcroppings, about half a mile upstream of the take-out. Cool boulder with shelf jutting out. Approaching Big Platte Road bridge take-out (w/trusty shuttle bike on left). The take-out downstream side of bridge river-right is less muddy and has more rocks to anchor yourself against.